The ThermiRF RF system has received 510(k) clearance from the US FDA for dermatological and general surgical applications in soft tissue and nerves. ThermiRF is the first aesthetic technology, which applies the "science of heat" using temperature as a clinical endpoint, enabling plastic surgeons and aesthetic physicians to precisely heat soft tissue and nerves to achieve the desired aesthetic outcomes. Recently several plastic surgeons, dermatologists and cosmetic surgeons from around the country have reviewed the product for American Health and Beauty and the feedback is very positive so far. "Not every patient can tolerate non-invasive devices on the market such as Thermage or Ultherapy. The ThermiRF gives a less painful approach to skin tightening on different body areas and is ideal for patients with some laxity of skin that isn't severe enough for surgery," says Dr. George Davis of Woodlands Wellness & Cosmetic Center, a cosmetic surgeon in The Woodlands, Texas. St. Louis facial plastic surgeon, Dr. Brock Ridenour says, "it offers a minimally invasive method to control the delivery of radiofrequency energy (heat) to the skin, subcutaneous fat and fibrous septae. You can control the depth of treatment, internal temperature, and treatment time, all while simultaneously monitoring the external skin temperature for safety." 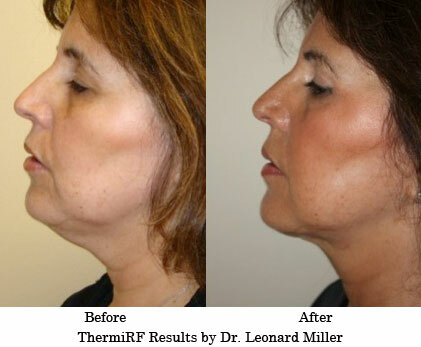 "ThermiRF bridges the gap between non-invasive and surgical treatments. Skin tightening results are far superior to any non-invasive treatment that I have worked with. Although it is minimally invasive, the down time consists of just a few days of minor swelling," says Dr. H. William Song who practices in New Jersey, "The ideal patients are in the age group of 40 and above with loose skin in the lower face, jowels, chin or neck area. People contemplating surgery, and people who are disappointed with the results of non-invasive treatments." The off-label uses for ThermiRF are wide, Dr. Song says in his blog, "ThermiRF device is currently being used for treatment of cellulite, to smooth out lumps after liposuction, reduce excessive underarm sweating, tighten loose vaginal skin, reduce double chins, and most commonly, for reducing wrinkles and tightening loose skin in the lower face and neck."